Buy 2 get 1 FREE on all badges! (mix and match with other badges too). A really great quality PVC tactical patch with very strong hook and loop fastener back. SAS Who Dares Wins Patch. A really great quality PVC tactical patch with very strong hook and loop fastener back. Royal Marines Commando Patch. 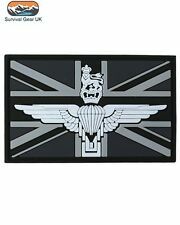 A really great quality PVC tactical patch with very strong hook and loop fastener back. Thin Blue Line Police Patch. A really great quality PVC tactical patch with very strong hook and loop fastener back. 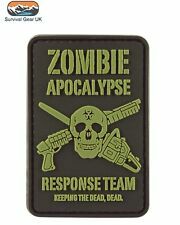 Zombie Response Team Tactical Patch. Green Beret pin badge Military. 1 x Royal Marines Commando badge. ROYAL MARINES COMMANDO. Quick sew on cloth patch. Approx badge size 11cm length x 4cm height x 0.2 thickness. CLOTH PATCH. This genuine military patch is a fantastic item to add a bespoke look to your bag, coats and jackets in a tough embroidered cotton. Original Russian Spetsnaz Red Star, Fist & AK47 lapel insignia badge. A really great quality PVC tactical patch with very strong hook and loop fastener back. Go Black Patch. SPECIAL AIR SERVICE EMBROIDERED BERET BADGE - SUBDUED - NEW. This will include the pin badge - the fridge magnet and a sew on / iron on patch at a great price. (as per last picture. Northern island veterans pin badge. army-navy-RAF - police ect. ). 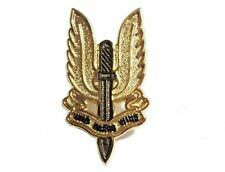 Parachutist Qualified Badge for the Special Air Service (SAS). This Parachutist machine embroidered badge features a light blue and white parachute with light blue wings on a navy blue badge. ORIGINAL RUSSIAN ARMY COCKADE. AS NEW CONDITION. Zombie Outbreak Response Team Tactical Patch. Russian Spetsnaz GRU Bat lapel badge. Size: 17 x17 mm. Very Popular with Forces, Airsoft, Cadets, Bikers, Veterans etc. These look so much better than an embroidered badge - the crispness of the PVC (like rubber) really makes the design stand out. PVC with velcro type,hook & loop fastener backing. Early 1990s Ciskei Special Forces Basic Parachute Wings Badge Bronze. Ciskei parachute wings badge in excellent condition. or more will now be sent by signed for services (GBP1.20 extra in UK or. GBP5.50 extra for overseas). Badge with screw at the back to fix it to a hat or jacket. Design work on the AK-47 began in the last year of World War II (1945). After the war in 1946, the AK-47 was presented for official military trials. Special Forces. Airborne, SAS , SBS, Chindit,and Commando etc. Badges Removed From Board For Posting.. Condition is Used. A collection of badges inherited from my late Father. I am not a dealer, collector or an expert, so if more photos are required please let me know. Dispatched with Royal Mail Signed For® 2nd Class.